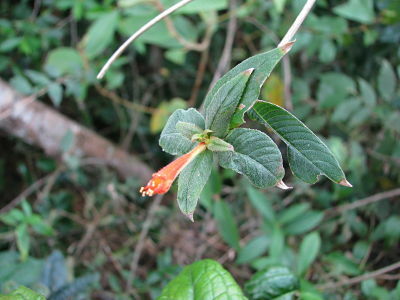 I am sorry to say that my former sites, Learn Plants Now and A Neotropical Savannah, have been dropped. 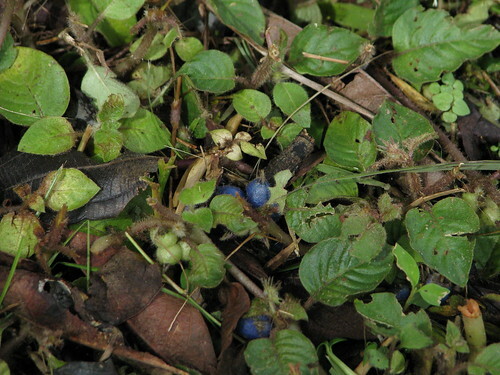 The internet is full of useful botanical sites now. Enjoy searching and learning! Update, 18 Aug. 2011: Someone from the Breadfruit Institute kindly left a comment below, suggesting that this tree might possibly be a breadnut rather than a breadfruit tree. 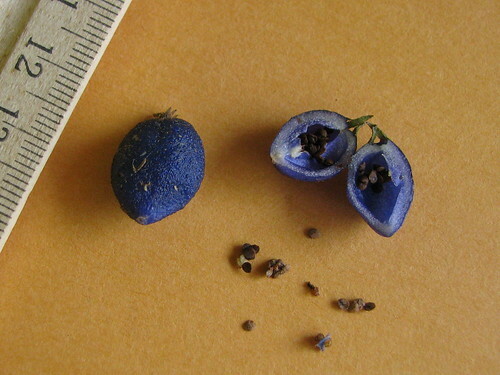 I’ll update this post further as the fruit matures, but for now we should leave the identification open. I’ll call it an Artocarpus sp. until the species name is verified. Update, 16 Nov. 2012: Alert reader Diane (see comments below) also agrees that this fruit is a breadnut rather than a breadfruit. Further, she knows how to cook it and eat it. With both botanists and interested naturalists agreeing that this is a breadnut, it is time to call it by its correct name. I’ll not rename the post, but we can agree now that the fruit shown is a breadnut, Artocarpus camansi. Our breadfruit tree is now five years old. I first saw this flower, inflorescence actually, two weeks ago. It is a female. The pale, yellowish structure to the right of the inflorescence is a stipule pair. The stipules will eventually fall off, leaving a scar – a horizontal line between leaves – that is typical of the family. In breadfruits this scar encircles the stem. 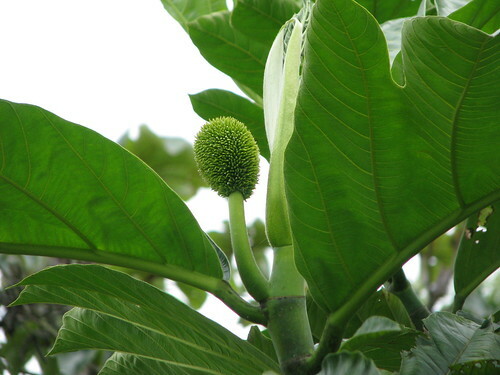 Breadfruit trees have male and female flowers on the same tree. This morning I spotted a male catkin even though typically the male flower appears first. 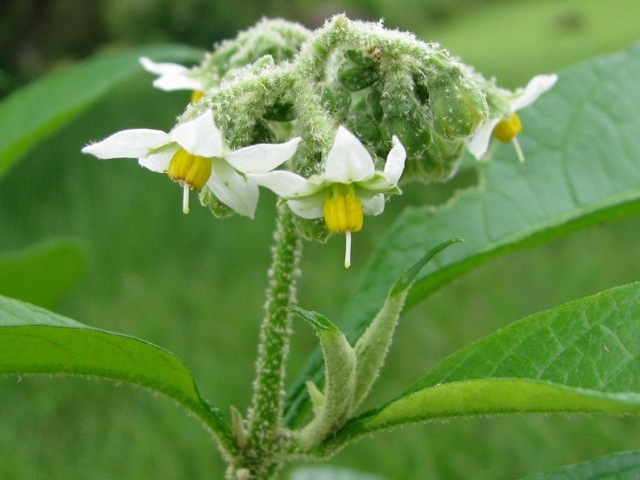 There may be 1500 or so tiny flowers in the female inflorescence. Zooming in, you can see the pistils pretty clearly and if you look at the outline against the green leaf, you can see some of the branched stigmas (the part that receives the pollen). You can also see a few white drops of latex exuding from some of the pistils. 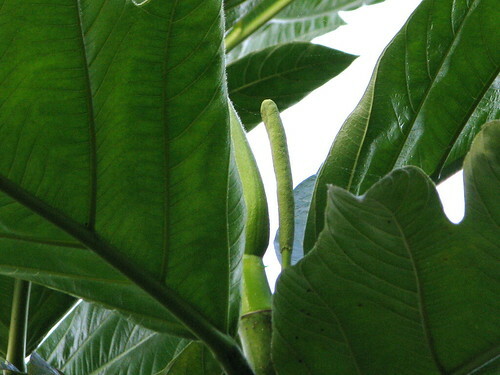 This latex, like the stipule scar, is a characteristic of the Moraceae family, which includes the rubber plant, figs, mulberries, and the osage orange. The pistils are attached to a spongy core and will eventually fuse together, forming the fruit, which is an aggregate like pineapple. Breadfruits are not native to Panama but are cultivated now throughout the tropics, despite the famous Mutiny on the Bounty. Our once-a-week, high-school aged gardener took the weedeater to a grove of Miconia rubiginosa for the first time this past weekend and uncovered this. 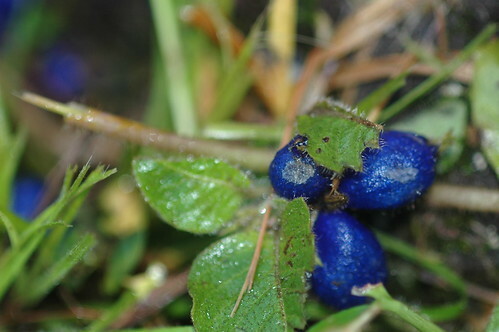 I thought they were a particularly bright blue berry of some kind. Took a few back to the front porch and sliced a couple open. Hmm. Well, if “berry” means “… any fruit that has its seeds enclosed in a fleshy pulp, for example, a banana or tomato” [my computer’s built-in dictionary definition], then I guess it’s not a berry. No fleshy pulp. This is going to be fun to sort out. Here’s a camera that went to Africa and recorded fine details in the environment that the retinas of early humans had to distinguish. A friend and retina expert most generously lent it to me while he and his wife are in the US. It’s an honor to use this camera. It’s a Nikon D70 and I’ve been a little shy about getting started with it, have mostly been shooting in autofocus and with the standard lens. Getting acquainted with the heft of the instrument. Today I decided to go for it and try the macro* lens. Still using autofocus, still adjusting to the heft, but trying, just to see what happens. 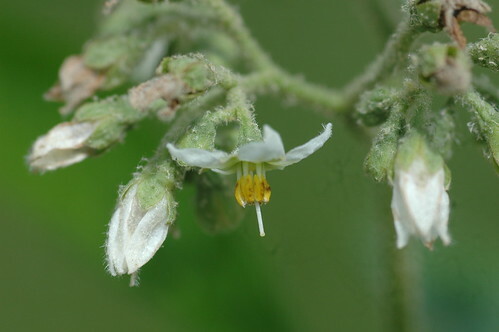 Starting at the time of last year’s bloom, I have been trying to get a decent shot of this species of Solanum. Here’s the best I’ve been able to do with my Canon point and shoot so far. This morning, with all the wrong conditions – sun bright in the sky, a breeze blowing – after very few shots, here’s what I got. I don’t know if you can see why I’m excited about the difference, but I am, and I’m encouraged that I’ll be able to get a really good one of this flower before the blooming season is over this year. These little firecrackers, as I call them, have eluded me for at least five years. I’ve tried on an off over that time, but they dangle in the breeze all the time, they’re small, and, well, here’s the best I could do before today. 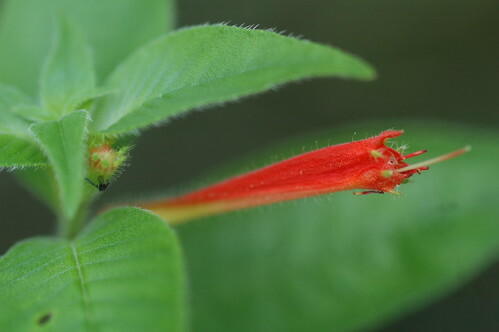 Even today, my Cuphea wouldn’t quite stay in focus. 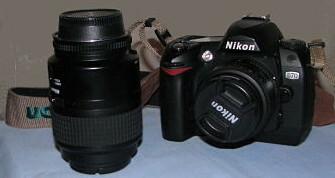 This lovely Nikon has several focus areas, and I’m still trying to get a grip on how to tell it which one I want. 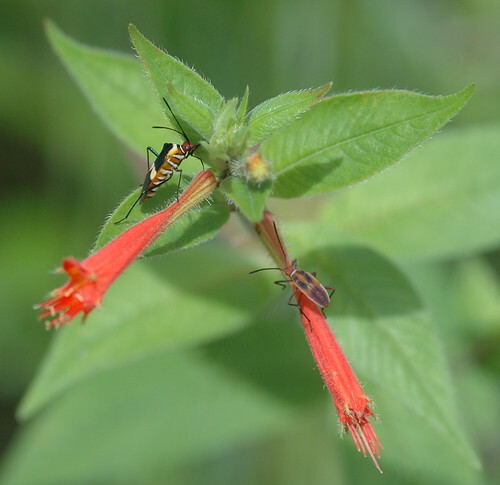 For now, Nikon is making these decisions, and today it decided the bugs on the Cuphea were far more interesting than the flower itself. So, while waiting for some delectable photos to come here at Accidental Botanist, feast on the current Berry Go Round at the irrepressible Plants are the Strangest People. It reminds me of a four-hour lunch I had in Italy way back when, and I’ll certainly be spending much of the rest of the month devouring all those intriguing posts. 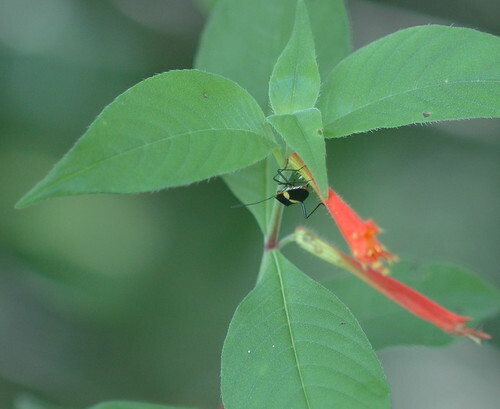 The insects look like leaf-footed bugs (family Coreidae) in the genus Hypselonotus. The only species in nearby Costa Rica with entirely black legs is H. concinnus, so this could be that species. You’ll see the comment below. *Nikon calls this lens micro. Its full name is AF Micro-Nikkor 60mm f/2.8D.